Jay Tibshraeny, the visionary mayor of Chandler, Ariz., helped turn his sleepy community into an economic powerhouse. When Motorola closed its 153-acre Price Corridor campus in Chandler, Ariz., in late 2008, then-State Sen. Jay Tibshraeny met with developers who wanted to rezone the land to residential housing – and urged them to look elsewhere. Despite the pressure to rezone as single-family housing, Tibshraeny stood his ground. Since his days on the Planning and Zoning Commission, through his years as a city councilman, mayor and as a state senator, he has been a fierce protector of Price Corridor as a driver of Chandler’s economic development. Now mayor once again, Tibshraeny has welcomed more than 2,000 jobs to the former Motorola site, with room to grow. Today, the corridor hosts over 35,000 jobs, including 11,000 that have arrived in the past 18 months, and its success has helped Chandler remain one of 31 cities nationwide boasting an AAA bond rating. Tibshraeny, who returned as mayor in 2011, is also lauded for his commitment to maintaining a neighborly feel in the community, even as it has grown from 10,000 residents in the 1950s to more than 245,000 residents today. 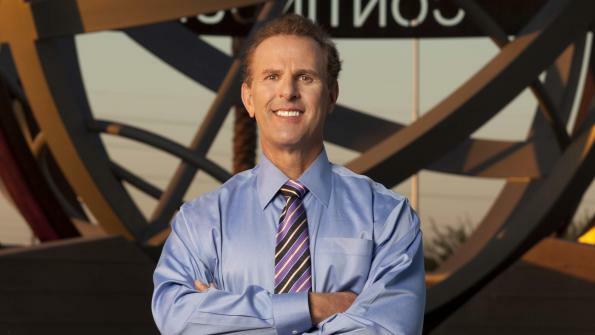 For his tireless commitment to preserving the economic vision of Chandler while maintaining a close-knit community in the fast-growing region, American City & County magazine has chosen Jay Tibshraeny as its Municipal Leader of the Year. Tibshraeny’s current tour as mayor comes after serving eight years in the state legislature. His career began in the city as a member of the planning and zoning commission from 1980 to 1986. He served on the city council from 1987-1994, including a stint as vice-mayor. His first tenure as mayor ran until 2002, when he ran for state office in a newly created district. His return to the mayor’s office went unchallenged. At the time of his return in 2011, the community was hurting badly from the effects of the Great Recession, most notably with high retail vacancy rates, rising from 7.1 percent in 2008 to 13.2 percent in 2011. To counter this trend, Tibshraeny launched his Four-Corner initiative to take a comprehensive look at the city’s retail environment, adopting a plan aimed at reducing vacancies and encouraging smaller shops and businesses. He also began a series of neighborhood meetings, called the “Mayor’s Listening Tour,” that were focused on interacting with residents and hearing concerns on issues at the most local level, especially in older neighborhoods without homeowners’ associations. Tibshraeny ensured that issues were followed up and resolved by the city’s Neighborhood Resources division. But it is Tibshraeny’s commitment to the Price Corridor that has brought him special praise. At the time that he was first elected to the city council in 1986, the city was transforming from an agricultural community to a commercial and industrial center. The corridor has been identified as an economic development center, in one form or another since the mid-80s, but Chandler was a much different place then. Since 1990, the population of the city has increased from 90,533 to 236,123, as of the 2010 Census and is estimated to have a population of 245,000 today. Total employment in the city has increased from approximately 34,000 to approximately 122,000. The total property tax base (full cash value) has soared over the past two decades from about $500 million to over $3 billion. At the beginning of the 1990s, Chandler went through a breathless growth cycle, adding an average of 1,000 residents every month. As one of the five fastest growing cities in the country, residential developers were drawn to the large tracts of land in the Price Corridor. Over and over again, the Mayor opposed residential development in the corridor, arguing that the land needed to be protected for future employment growth rather than for subdivisions. As a result of his commitment to economic development of the Price Corridor, Chandler has been rewarded with tremendous growth, particularly over the past 18 months. A total of 12 projects have been initiated, representing more than $5.6 billion of capital investment and 10,000 new jobs. Companies moving or expanding operation in the corridor include General Motors, Wells Fargo Bank and Nationstar Mortgage. Intel’s 1 million-square-foot, $3 billion plant was, at the time, the second-largest construction project in the world and attracted two visits from President Obama. While Tibshraeny promoted economic development in the city, he also was fervently devoted to ensuring the viability of its neighborhoods, says Jennifer Morrison, the director of neighborhood services. “He’s very committed to making a big town feel like a small town,” she says. She is particularly excited about three initiatives that Tibshraeny has undertaken since he returned to local office. The Listening Tour held five meetings in its first year, which were attended by city department heads and senior staff, as well as members of the Neighborhood Advisory Committee and usually 50 to 75 area residents. A 2013 updated version of the tour (“2.0”, she calls it) consists of roundtable discussions, specialized training and information on revisions in laws affecting homeowners’ associations. A second initiative was an “academy” that focused on leadership training for residents from areas of the city that were developed before homeowners’ associations. City officials taught leadership skills, including how to access city services to improve neighborhoods and how to ensure neighborhood continuity through instilling pride and proper maintenance. A third focus, she says, has been a voluntary program to eliminate blighted structures. Of the 30 buildings that the city targeted, 12 owners voluntarily cleaned up structures, five demolished them and six remodeled them. The seven remaining are now facing enforcement action. The mayor, who is 59 years old, says that his focus on city improvement derives from his lifelong home in Chandler and his “fond memories” of his youth. Still, he is aware that the city must adapt its policies and infrastructure to accommodate the enormous changes that have taken place since then. Sharing the mayor’s attention is his commitment to the neighborhoods that comprise the city, especially the older areas. In addition to his listening tours and academies, he has made city officials available through online or virtual forums, where residents can email questions and receive immediate responses from city officials. Online services also allow access to the annual budget review. The sessions were broadcast on the city cable channel. The mayor is an active Twitter user, and often sends out pictures from his meetings with residents. He is currently promoting an app, called Nextdoor, which helps connect residents to their neighbors. At the same time, Tibshraeny understands that sometimes these two visions – thriving industry and neighborhood dominance – have the potential to conflict. The expansion of the Salt River Project (SRP), which supplies critical power supplies to the industrial base, presents challenges that he is trying to negotiate. SRP is currently engaged in a siting study to identify locations for two huge power routes and two new substations. When he’s not meeting with utilities, neighbors or other officials, Tibshraeny operates a family real estate business – yet another way he puts his heart into Chandler. On a typical day, Tibshraeny may leave the house for his first meeting at 5:30 a.m. and not get home until 8:30 p.m. During the day, he receives phone calls from constituents and colleagues and, of course, is continually sending out Tweets, more than 1,300 so far.